Our Shabbat menu also features your choice of meat dish. Imagine the sensation of our Turkey and Beef Meatballs in Moroccan Sauce as it hits your tongue for the first time. Your mouth begins to water and your stomach grumbles getting ready for the wholesome taste. This is just one of the many meat dishes offered on our Shabbat menu. Which meat dish will be your guests favorite? Well, that is to be determined, but they are all sure to please and excite. Roasted whole chicken filled with minced meat, rice, pine nuts and baharat. Chicken thighs with plums and date syrup. Turkey and beef meatballs in Moroccan sauce. 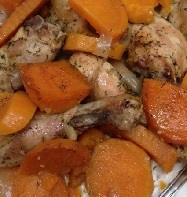 Teriyaki chicken with red garlic potatoes and yams. Beef goulash with okra, fresh tomato sauce and herbs. We also have 2 other delectable meat menus. Browse our Meaty Event Menu and our Meaty Cocktail Menu.